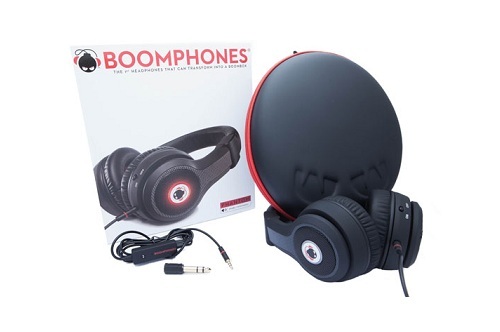 DJ Style Headphones with external speakers. Convertible hi-fi headset with integrated external boombox functionality. Tailor your musical experience with two independent pairs of precision-tuned speakers, and three listening modes.Turn on the power for amplified bass from beyond the velvet rope. Or redirect all of it to the external speakers and add BOOM to the room. Two interchangeable high-performance cables - One for simply listening and the other with integrated mic for hands-free mobile phone use, plus in-line remote for volume and call control. $99.98 & eligible for FREE Super Saver Shipping.